The Edgar Allan Poe Episode. If you like hiding in dark places then meet me in the graveyard, I want to introduce you to Edgar Allan Poe. Get ready for the master of mystery and madness. Never trust anyone in a poem or story by Edgar Allan Poe. The truth is always murky. It seems the truth about Poe’s real life is unclear too. He dramatically exaggerated the facts. We do know he gambled, argued, drank and died poor in Baltimore. But like a ghost from one of his tales, Edgar Allan Poe lives on to haunt poetic souls today. 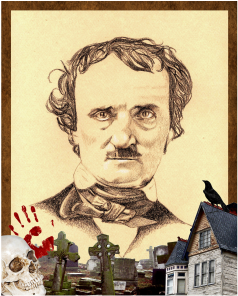 Whether you like horror or not, Poe can teach you a lot about charming readers with the music of language. Gaily bedight: Dramatically dressed to look good. Pilgrim: A traveler on a quest searching for something. This poem has a slow galloping rhythm, and it’s probably best read on horseback. See if you can create a galloping rhythm by tapping it out. You don’t have to be a musician to appreciate the beat. When writers mention well-known places, famous people, or historic events they are making allusions. Allusions are references to well known people, places and things. Eldorado is an allusion to a mythical place. See what you can find out about Eldorado. What was so great about it? Why would people risk their lives to find it? Everybody longs for something. In this poem, Eldorado becomes a metaphor for our longing and desires. Here are a few questions to ask. Edgar Allan Poe is famous for the musical quality of his writing. One device he uses often to enhance the rhythm of his lines is alliteration. Alliteration is the repetition of consonant sounds in a series of words. "Over the mountains/ Of the Moon"
See if you can create some alliterative lines. Start by selecting two or three words that begin with the same sound, like goblin, ghost, and grave. Mix them up in different ways until you find a pattern you like. Now see if you can create an entire poem that will scare you friends and family.